Belize Maps including topo maps etc. This latest product follows the Meerman & Sabido (2001) map, which was essentially an update of the 1995 Vegetation map of Belize by Iremonger and Browkaw. This Iremonger and Brokaw map borrowed heavily from the 1959 Natural Vegetation Map of Belize by Wright et al. For the marine part, there existed a draft marine habitat map (Mumby & Harborne, 1999). 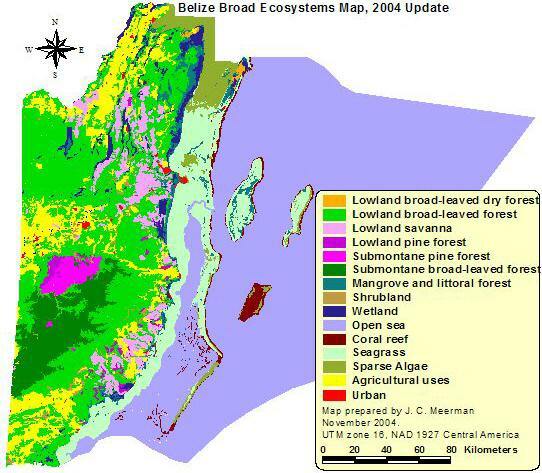 The scale of the latter map was much finer that that of the Belize Ecosystems Map. Also, this map existed only in a draft stage and its accuracy is assumed to be no greater than 60%. To overcome the inconsistencies caused by the differences and reliability of both products, the various groups of habitats in the Marine map were clustered as to represent their main classifications and this result was re-digitized into polygons with a minimum size of 1 acre. Brokaw & Sabido, 1998. Vegetation of the Rio Bravo Conservation and Management Area. Penn et all, 2004. Vegetation of the Greater Maya Mountains, Belize. The original ArcView shapefiles can be downloaded as a zipped file (2,904 kb). The shapefile comes with full metadata. Please read the use constraints section in these metadata before using the data. Meerman, J. and W. Sabido. 2001. Central American Ecosystems: Belize. Programme for Belize, Belize City. 2 volumes 50 + 88 pp. 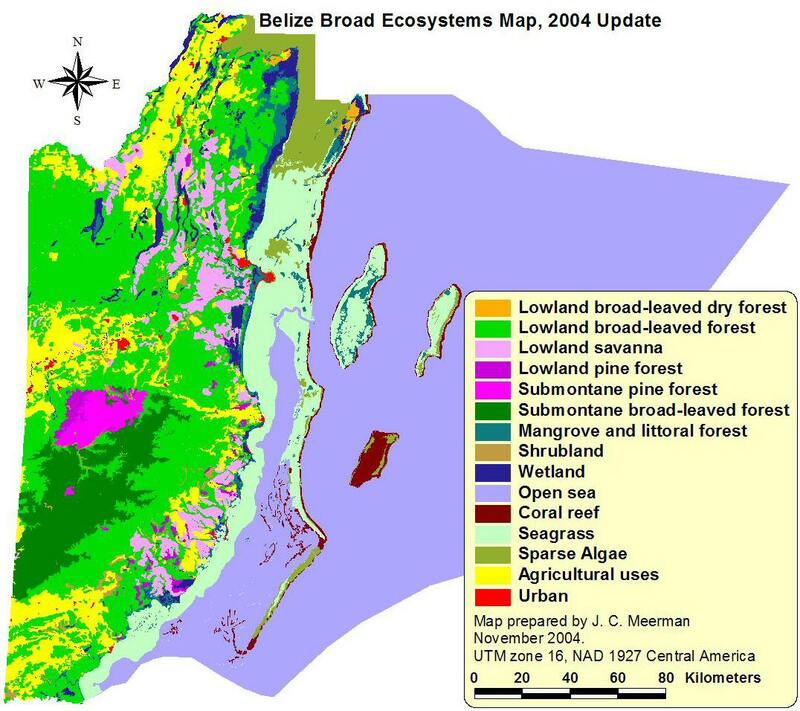 The original 2001 report on Belizean Ecosystems and vegetation types was produced as part of the Central American Ecosystems Map (Worldbank/CCAD) and recognized 86 different ecosystems for Belize. The report described each of the ecosystems including a list of plant species identified in these. Maps give information on altitude, broad ecosystems, detailed ecosystems and fire risk. The report is published in (low resolution) pdf format as Volume I (464 kb) and Volume II (1,422 kb). The Original ArcView files (zipped 1,048 kb) should now only be used when a comparison between the 2001 and 2004 maps is required. This 2001 project was part of the much larger Central American Ecosystems Mapping Project. In this project all of Central America's ecosystems were mapped to a level of 1:250,000. A graphic impression of the draft product is available for viewing. A wall poster (in Spanish) has also been produced. Posters can be obtained at the Programme for Belize office in Belize City. The final report on this project was finished in 2002 (Vreugdenhil, Daan, Jan Meerman, Alain Meyrat, Luis Diego Gómez, and Douglas J. Graham. 2002. 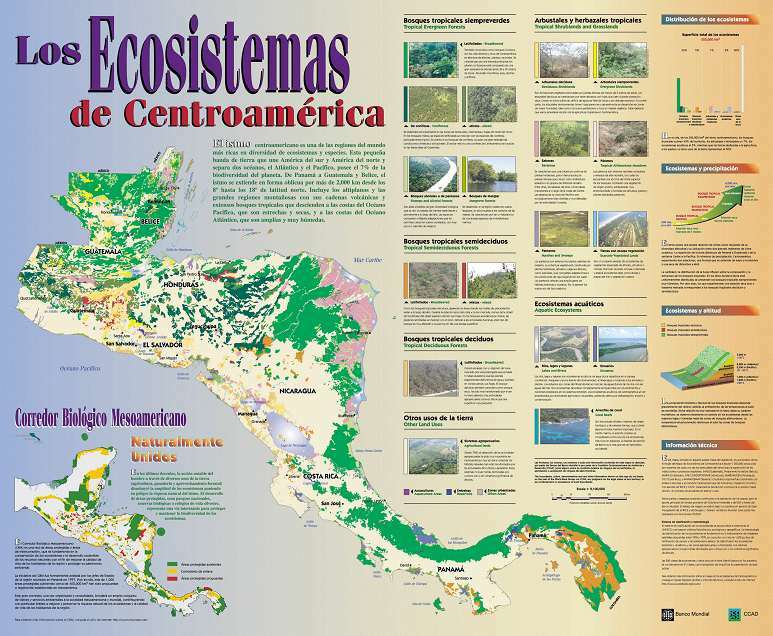 Map of the Ecosystems of Central America: Final Report. World Bank, Washington, D.C.. And again can be downloaded in zipped pdf format (1,543 kb). This and other files are also available for download from the WorldBank Environmental Website. This includes “Ecosystems Map of Central America” maps: files of all 43 map sheets, which can be opened in PowerPoint. Arc-Info files, ecosystem descriptions (200+ pages), and final report can also be downloaded from the same site. A number of additional files can also be downloaded from the WICE website or from the USGS site. To work with the Arc-Info, GIS (Global Information System) software is required. You can download free ArcExplorer software by going to the ESRI webpage (click logo on the left). ArcExplorer is a lightweight GIs data viewer developed by ESRI. This freely available software offers an easy way to perform basic GIs functions. SERVIR is the map-server for Meso-America. Through the internet, its purpose is to provide information to many users that will assist the protection of natural resources and biodiversity in Central America. From maps of ecosystems throughout the Central American region, the map-server can be used to provide information in formats understandable to key decision-makers, as well as the needs of project analysts and researchers.